Aluminium doors and instrument panels are an essential feature of some applications, e.g. in electronics on controls desks or for display panels. In these situations we offer aesthetic aluminium frame technology, engineered to suit specialist cabinets in standard or custom sizes. They are designed as tamper resistant see-through covers for instrumentation or other information e.g. announcement or mimic panels and offer cost saving benefits as complete factory assembled units ready for use on cabinets or as visual panels such as signs for directions, information or advertising. 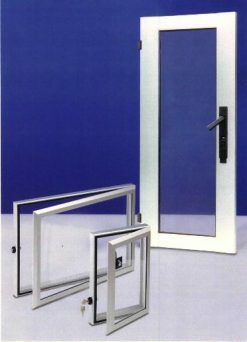 As full doors the 1300 and 1200 series offer an anodised aluminium frame with fully glazed panel in 3mm acrylic, or polycarbonate for external applications. The 1200 series can also be used as window panels in 100mm modules from 300mm to 1000mm wide and up to 2000mm high. These can be used as simple lay-on viewing panels, or together with a depth extending frame of 30mm or 61mm, which is ideal for situations where protruding instruments or push buttons are being covered for additional security. Side locking options can be used with depth frames ensuring no loss of visible area, and where horizontal hinging is required then gas spring supports are available as safety supports. 1300 series doors are a complete complement to large cabinets where style and visibility are prime requirements – they are supplied fully assembled with integral hinges and an 1180 series swing handle and rod locking system. 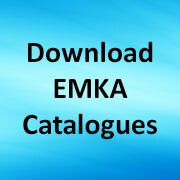 The 1180 system features a low profile swing handle with protective sliding cover and accepts interchangeable lock modules from the EMKA range to suit particular key form requirements, e.g. key locks or insert locks. Door opening of up to 180 degrees can be achieved with the 1300 series as a stand alone installation and to 120 degrees when used as an in-line suite. Share the post "Smart doors for special cabinets"